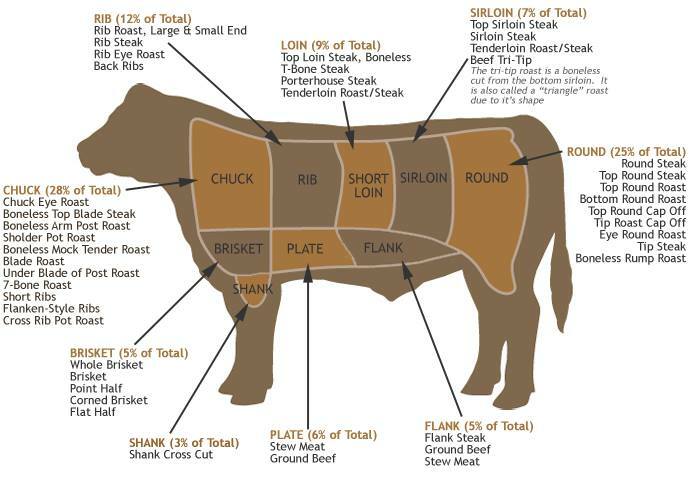 When purchasing a side of beef or pork there are 3 different weights that are used to determine the cost of the beef and pork. They are the Live weight, Hanging weight and the Take-Home weight. The weight of the animal on the hoof when it is still alive. Our live weight animals average around 1,000 lbs for beef and 220 lbs for pork. The weight of the animal after slaughter, and after removal of blood, head, hide, hooves and viscera. In comparison to the live weight, it is about 60% for beef, and 70% for pork. Per pound cost is based on this weight. This weight is also used to determine cut/wrap cost from the butcher. Live weight of 1000 lbs, yields approximately 600 lbs hanging weight for beef. Live weight of 220 lbs, yields approximately 154 lbs hanging weight for pork. The weight of the meat taken home from the butcher. The final weight is determined by the water loss during the 10-14 day curing process, along with fat removal, cut type and amount of bones in the meat. Upon completion this weight is approximately 65% of the hanging weight. Hanging weight of 600 lbs yields approximately 392 lbs take home weight for beef. Hanging weight of 154 lbs, yields approximately 100 lbs take home weight for pork. For beef, the cost per pound when processing is factored in will average around $6/lb for all of the cuts such as burger, steaks, roasts, etc. The pork cost will be closer to $6.50 per pound when processing is factored into the cost. Upon submitting a deposit, you are added to the purchase list. You can send a deposit to Rocky Oak Farms 6850 Hoag Rd. Albion, MI 49224. Please include your contact information and what it is you are putting a deposit in for. As the butchering date approaches you will be contacted with the exact date we ship to market, along with contact information for the butcher. Following the market day, you will need to reach out to the butcher and complete your order with the cuts that you desire. 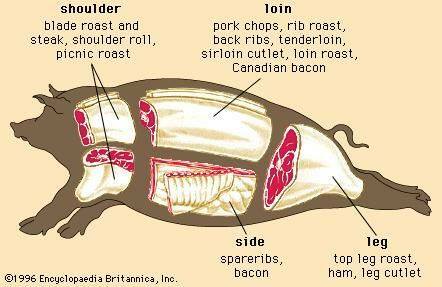 Available below are diagrams and order sheets from the butcher to help you determine your cuts. If you are unfamiliar with the process, we or the butcher can walk you through the process. After processing, you will be contacted with instructions for pickup. 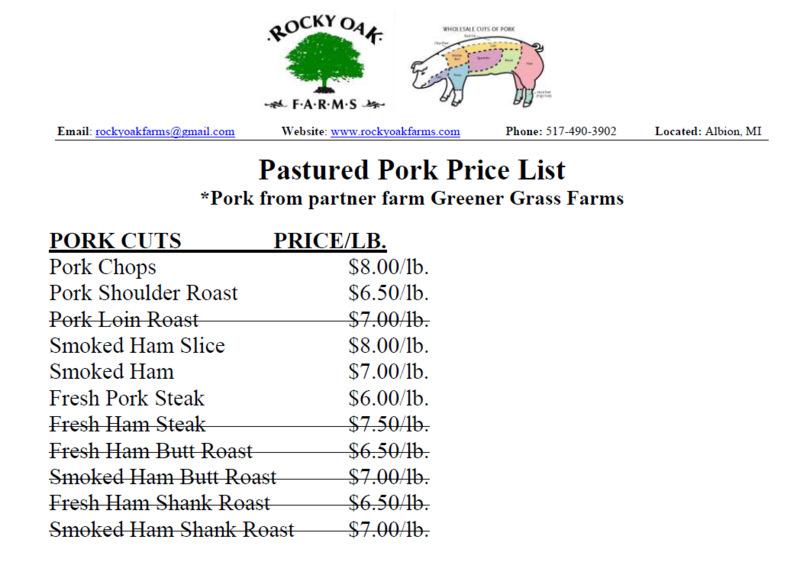 If you are local, we ask you meet us at Rocky Oak Farms the same day we pick up from the butcher. For a large enough order we can accommodate you with delivery if you are not local. Currently, we often have several orders from Chelsea and can arrange a delivery if you also reside in that area. Please contact us to determine how we can accommodate you. Cattle are available by the quarter, half or whole animal or by individual cuts. A typical quarter will weigh about 140 lbs hanging weight. We do require a $100 deposit per quarter. This is non-refundable, but is factored into the total cost. We are currently priced at $3.45/lb hanging weight plus processing. A quarter of beef will cost approximately $600 total and yield about 90 lbs of meat. Each cut is vacuum sealed with a label on the package containing the cut name & weight, your name and our farm, Rocky Oak Farms. Pigs are available by the half or whole. A typical half a pig will weigh in around 70 lbs hanging weight. We do require a $100 deposit per half. This is non-refundable, but is factored into the total cost. We are currently priced at $3.25/lb hanging weight plus processing. A half a pig will cost approximately $400 total and yield about 65 lbs of meat. Chickens are sold as a whole bird, but upon request, can be processed whole or cut up before we send them to slaughter. They are currently priced at $4.50/lb. and have been ranging from 3.5-4.25 lbs dressed. Each chicken will cost approximately $14-17. Each chicken is vacuum sealed with a label containing the weight and the processor's information.